only option was to stay at home and watch TV. any complains and we went to the airport. For our surprise, hundreds of Vegans were there with their kids as well. There were Elsa, Anna, under a Frozen temperature. There were also Batman and some ready to go to bed wearing pajamas. The sixth floor has plenty of spot to chose from; it's a huge balcony with Strip views. We crossed the bridge, where we could sit in the car, having hot cocoa and wait for the fireworks; only leaving the car seconds before midnight. Here we go, the fireworks begun! 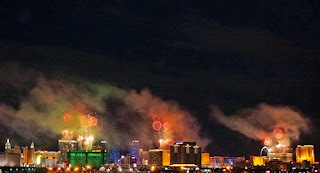 It wasn't "the biggest fireworks ever" but was worth to see the kids so happy. For them, the night was over the top! Leaving the McCarran was a little bit hard, with hundreds of cars trying to get to the exit. The kids hit the sac in not time.